The ultimate in group painting convenience! The ultimate in group painting convenience! 36 large multi-purpose Crayola® paintbrushes in 3 brush tip styles: 12 each of Crayola’s Jumbo Brush (natural bristles/plastic handle), Large Flat Brush (white synthetic bristles/painted wood handle) and Large Round Brush (white synthetic bristles/painted wood handle). Soft, shed-proof bristles. 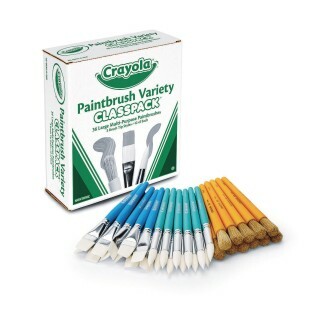 Great for use with tempera, acrylic, and washable paints. 36-piece pack.